“Protest Spaces: Peace Movements in the United States and Germany, 1920-2000” (www.protestspaces.org) is a transnational collaboration of scholars from Cleveland State University in Ohio, Air Command and Staff College in Alabama, and Mannheim University in Germany. The research team combines historical data on protest and grassroots demonstrations gathered from American and German archives in a location-based multimedia database of protest events and archival materials in the United States and Germany, creating a geospatial research tool for humanities scholars worldwide. Both the pilot and long-term project use Omeka and Neatline. The database will eventually include an archives section which maps the locations of archival materials gathered and deposited by activists in the United States and Germany. This central digital database will facilitate international cooperation and dissemination of humanities scholarship by providing scholars with a new analytical tool for studying protest and grassroots demonstrations. 3.) transnational events which themselves crossed national borders and fostered connections between activists in different locations, such as Women’s International League for Peace and Freedom (WILPF) international summer schools in the 1920s and San Francisco to Moscow March for Peace from 1960 to 1961. Each of the three categories includes the wide range of protest practices used by activists to appropriate public spaces, both in a literal and metaphorical sense, such as sit-ins, die-ins, military base blockades, nuclear free zones, and vigils. Through these lenses, scholars will be able to visualize patterns in the activists’ use of space which are otherwise obscured by the nature of archival research and the limits of studying protest events within individual archival collections. 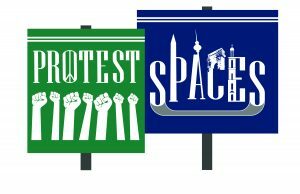 By curating information from diverse archives in the United States and Germany into the “Protest Spaces” platform, humanities scholars will have access to a unique set of geospatial visual data to enhance traditional academic protest research. The project originally emerged from the dissertation research of Shelley Rose and Jared Donnelly. In 2014, we collaborated with Philipp Gassert and Philipp Baur of Mannheim University on a National Endowment for the Humanities (NEH) / Deutsche Forschungsgemeinschaft (DFG) Biliateral Digital Humanities Grant. We were not successful, but learned much from the external reviewer reports, including the challenges of applying to a program administered by two different national research agencies. One of the most important lessons was to have a small scale pilot project to showcase in the proposal to help reviewers understand what the digital humanities product will look like. This is why we are currently piloting case studies from each of the three categories above for our next cycle of grant applications in Fall 2016. This cycle will not include the NEH/DFG because the program has been discontinued. Protest Voices Project: This summer, two undergraduate student researchers at Cleveland State are collecting oral history interviews from local activists, focusing on anti-Vietnam protests and Cleveland’s active Catholic community which mobilized around four female mission workers who were murdered in El Salvador in December 1980. These interviews will provide material for the issue-specific category of the pilot project, and demonstrate the significance of including both American and German events in the Protest Spaces project. Archival collaborations: In Germany, most protest movement collections are housed in a variety of movement archives rather than in the larger institutions. Protest Spaces will display information from these archives to make sources more discoverable and aid in planning archival research trips. In the future, we hope to conclude agreements with the major archival collections in the US and Germany in order to provide rich content for Protest Spaces and publicity for the collections. Future contributor policies: We need to consider how we will generate content long term. Should this be through an open call, like a call for encyclopedia entries, or keep content creation in the hands of our research team. Integrating historical map overlays: One of the critiques from our NEH/DFG reviewers was that we need to articulate a clear plan for including historical map overlays. We are currently exploring Geoserver and other options. Bilingual Interface: should we consider a bilingual interface? What would this look like?